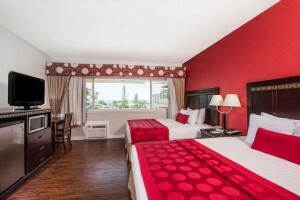 Relax in our modern air-conditioned, non-smoking King Guest Room when you stay at the Ramada by Wyndham San Diego Airport. 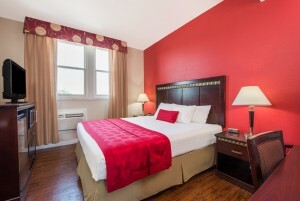 Our King Room features a comfortable king-size bed, along with popular amenities like free high speed internet, refrigerator and microwave, coffee/tea maker, 37 inch flat screen TV and enjoy a free continental breakfast in our dining area. All guest rooms at our San Diego hotel feature a private full bathroom with shower/tub combination, hair dryer, plush towels and complimentary toiletries. Free local calls, safe, and iron/ironing board are available for guest convenience. Free cribs/infant beds are available on request. Some guest rooms feature a private balcony. Unwind in our modern air-conditioned, non-smoking 2 Queen Bed Guest Room when you stay at the Ramada by Wyndham San Diego Airport. 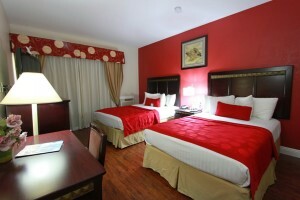 This oversized family room features 2 comfortable queen-size beds that can easily accommodate up to 4 adults. This spacious guest room offers popular amenities like free high speed Internet, refrigerator and microwave, coffee/tea maker, 37 inch flat screen TV and enjoy a free continental breakfast in our dining area. All guest rooms at our San Diego hotel feature a private full bathroom with shower/tub combination, hair dryer, plush towels and complimentary toiletries. Free local calls, safe, and iron/ironing board are available for guest convenience. Free cribs/infant beds are available on request. Some guest rooms feature a private balcony. 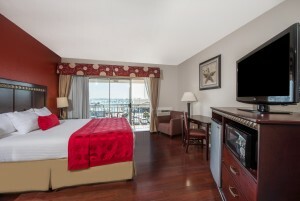 Stretch out in our non-smoking suite with 2 queen beds. This air-conditioned suite offers 2 queen beds and a sofa bed with room for up to 5 guests and includes mini-refrigerator, microwave, and coffee/tea maker. Stream your favorite programs with free high-speed WiFi or watch a variety of shows on cable TV. All guest rooms at our San Diego hotel feature a private full bathroom with shower/tub combination, hair dryer, plush towels, and complimentary toiletries. Free local calls, safe, and iron/ironing board are available for guest convenience. Free cribs/infant beds are available on request. Some guest rooms feature a private balcony. Our air-conditioned, non-smoking King Accessible Guest Room features a comfortable king-size bed, along with popular amenities like free high-speed internet, refrigerator, and microwave, coffee/tea maker, 37-inch flat screen TV and enjoy a free continental breakfast in our dining area. This ADA compliant Accessible Room is wheelchair accessible and features a private full bathroom with bathroom rails and shower bars, hairdryer, plush towels, and complimentary toiletries. Free local calls, safe, and iron/ironing board are available for guest convenience. Free cribs/infant beds are available on request. 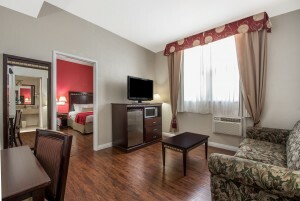 Our air-conditioned, non-smoking 2 Queen 2 Bedroom Beds Accessible Suite features two queen beds, along with popular amenities like free high-speed internet, refrigerator, and microwave, coffee/tea maker, 37-inch flat screen TV and enjoy a free continental breakfast in our dining area. This ADA compliant Accessible Room is wheelchair accessible and features a private full bathroom with bathroom rails and shower bars, hairdryer, plush towels, and complimentary toiletries. Free local calls, safe, and iron/ironing board are available for guest convenience. Free cribs/infant beds are available on request.